Welcome to Revive Auto Repair in Troy, a full-service preventive maintenance and automotive repair center. We perform high quality, guaranteed service you can trust at a fair price. We repair Domestic, Foreign, & Asian vehicles and are your best choice for scheduled maintenance of your car, SUV, truck and fleet vehicles. 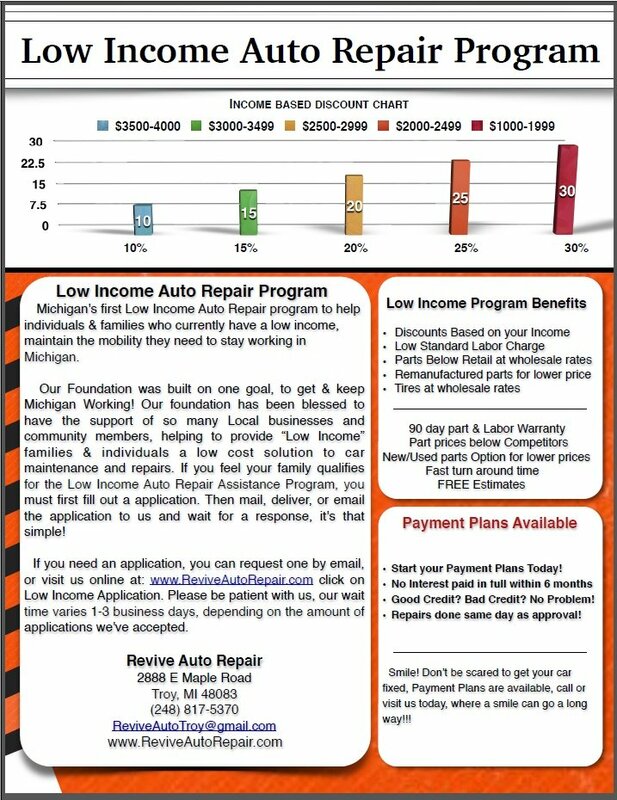 We also offer, Michigan's first Low Income Auto Repair program to help individuals & families with low income, maintain the mobility they need to stay working in Michigan. Our Foundation was build on one goal, to get & keep Michigan Working! Our foundation has blessed to have the support of many Local business helping to provide Low income families & individuals a low cost solution to car maintenance and repairs. If you feel your family qualifies for the Low Income Auto Repair Assistance, you must first fill out an application. If you need an application, you can request one by email, phone, fill out an application online, or stop by to pick one up. Then mail, deliver, or email the application to us and wait for a response, it's that simple! The application email is lowincome@reviveautorepair.com. Please be patient with us, our wait time varies month to month depending on the amount of applications we've accepted.